Preheat oven to 350 °F. Chop and mince onion and garlic. Slice bacon into small pieces. Brown bacon in a casserole pot on the stove. Add chopped onions and garlic with the bacon and sauté for 5 minutes. Add ground beef, salt, pepper and oregano and cook until the meat is no longer pink. At this stage, you can drain the excess fat. Next, add the diced tomatoes and broth and bring to boil. 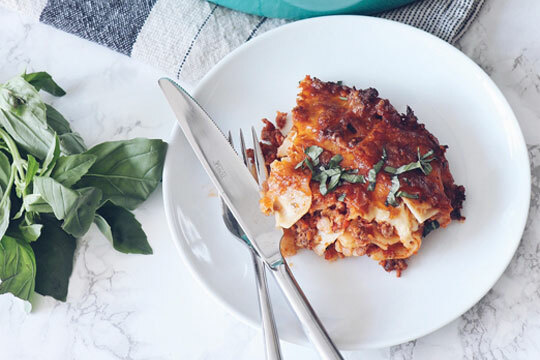 Once boiling, turn off the stove heat and mix in the cream cheese and lasagna noodles. (break each lasagna noodle is 3 or 4 pieces). Stir in well, and cover all the noodles with tomato sauce. Cover with mozzarella cheese. Transfer the casserole pot to the preheated oven and bake for 25 – 30 minutes. For the last 10 minutes, turn oven to 400 °F and cook until cheese is golden brown. Let it cool and top with chopped basil.